Thank you to everyone who has welcomed the incoming board for 2018. The feedback I have received from our members indicates there is plenty of work available for our industry. However, the most common problem experienced by many hirers is finding quality employees. Several hirers currently have ads on seek, but it appears they are unable to fill the positions. Many of the applicants attend the interviews to have their Centrelink requirement fulfilled but are not actually interested in the position advertised. 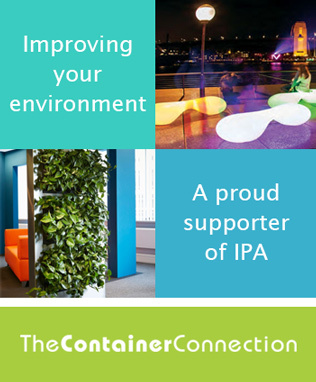 Interior Plantscape Association (IPA) recognises this problem and we are looking at solutions that will support our members. Maybe we need to be building relationships with High School vocational education programs to find suitable employees and have them trained while at school to Cert 3 level and also encourage them to seek work experience with a Plantscape hirer, this costs the hirer very little money. As we all know there is a lot more to a plant technician’s job than most applicants realise. I recall a Hire Manager saying at a conference that 50% is knowledge and 50% is the personality of technicians. The other issue that worries me is the inability of the younger generation aged between 18 to 35 years old to face clients for direct discussion. Emails and texts don’t help with networking and building relationships with clients and we all need to be aware of these shortcomings in our younger employees. The challenge for business owners is to find this generation’s communication style because when they go into an office environment to maintain the plants they have to be able to communicate effectively and most of the younger generation struggle with face to face conversations. If you have any constructive feedback on this topic you are welcome to contact me at sales@sunnydale.com.au as we all need to be planning ahead for our staffing needs. I don’t see it getting any easier but together I feel confident we will find the solution. Providing the highest value to our members is always our top priority! Make sure you keep your eye on our future newsletters as we are in the planning stage of adding value to your membership.